Gene therapy treating the neurodegenerative disease, SMARD1, shows promising results in mice studies. Monir Shababi was confident her experiments treating a rare genetic disease would yield positive results before she even ran them. 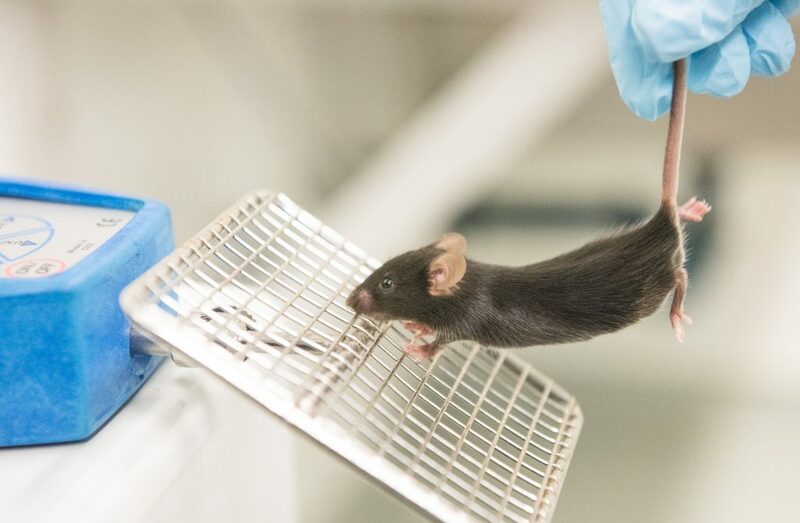 Scientists had success with a similar degenerative neuromuscular disease, so she had every expectation their strategy would work just as well in her mice. “I was expecting to get the same results,” said Shababi, an assistant research profession in Christian Lorson’s lab at the University of Missouri Bond Life Sciences Center. 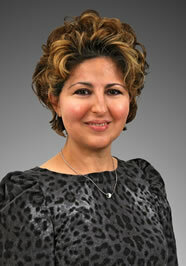 Shababi studies spinal muscular atrophy with respiratory disease type 1, or SMARD1. The treatment worked, but not without a few surprises. Her findings, published in Molecular Therapy, a journal by Nature Publishing Group, are one of the first to show how gene therapy can effectively reverse SMARD1 symptoms in mice. In patients, SMARD1 is considered such a rare genetic disorder by the U.S. National Library of Medicine that no one knows how frequently the disease occurs. It’s only when babies develop the first symptom—trouble breathing–that pediatricians screen for SMARD1. Shortly after diagnosis, muscle weakness appears in the hands and feet before spreading inwards to the rest of the body. The average life expectancy for a child diagnosed with SMARD1 is 13 months. There is currently no effective treatment. Since the neuromuscular disease is caused by a recessive gene, SMARD1 comes as a shock to the parents, who are carriers but do not show signs of the illness, Shababi said. This genetic defect prevents cells from making a particular protein that scientists suspect is vital to replication and protein production. The hereditary nature of the disease has a silver lining, though. Because SMARD1 is a caused by a single pair of faulty genes and not multiple ones, it is a prime candidate for gene therapy that could restore the missing protein and reverse the disease. To do that, Shababi set up a dose-response study using a tiny virus to carry the genetic instructions for making the missing protein. She injected newborn mice with a low dose of the virus, a high dose, or a placebo with no virus at all. Injecting at different doses allowed her to ask which dose worked better, Shababi said. According to the previous research, a higher dose should have resulted in a more effective treatment. “So I thought a higher dose was going to work better,” Shababi said. Instead, the high dose had a toxic effect. Mice given more of the virus died sooner than untreated mice. Meanwhile, mice given a low dose of the gene therapy lived longest. They regained muscle function and strength in both the forearms and the hind limbs and became more active. In fact, some of them survived long enough to mate and produce offspring. Initially, Shababi housed her SMARD1 mice in the same cage as their mothers so that the moms could intervene if the sick pups become too feeble to feed themselves. When the male pups became well, their moms became pregnant. 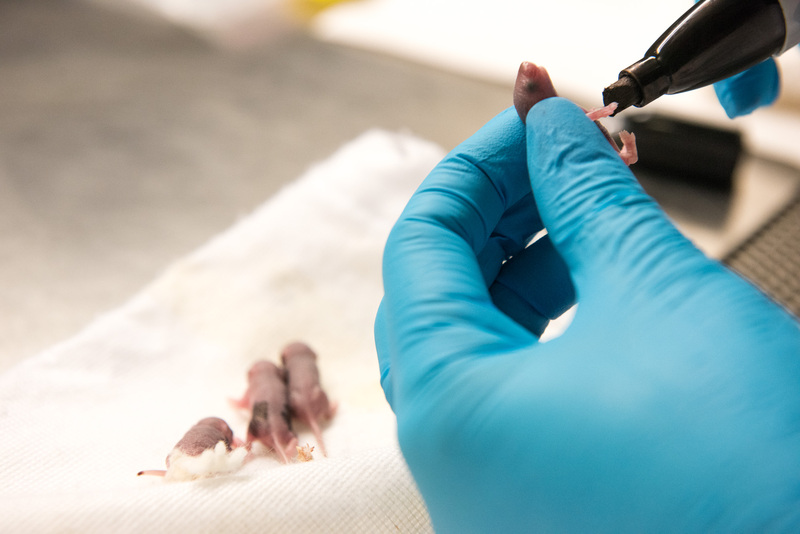 Shababi marks a pup, only a few days old, with permanent marker so each mouse in her study can be identified. | photo by Jennifer Lu, Bond LSC . In another twist, Shababi discovered that the route of injection also mattered. To get the treatment across the blood-brain barrier and to the spinal cord, Shababi used a special type of injection that passes through the skull and the ventricles of the brain, and into the spine. The newborn mice were no larger than a gummy bear. To perform the delicate work, Shababi — who has written a chapter in a gene delivery textbook about this procedure — had to craft special needles with tips fine enough for this injection. She added food coloring to the injection solution so she could tell when it had reached its intended destination. Unfortunately, repeated injections in the mice caused hydrocephaly, or swelling in the brain. “They get a dome-shaped head,” Shababi explained. The swelling happened in all three treatment groups, but most frequently in the group that received a high dose of viral gene therapy. This reinforced the finding that while a low dose was beneficial, a high dose was even more harmful than no treatment at all. It’s unclear why. Christian Lorson is a professor of veterinary pathobiology at the Bond LSC. 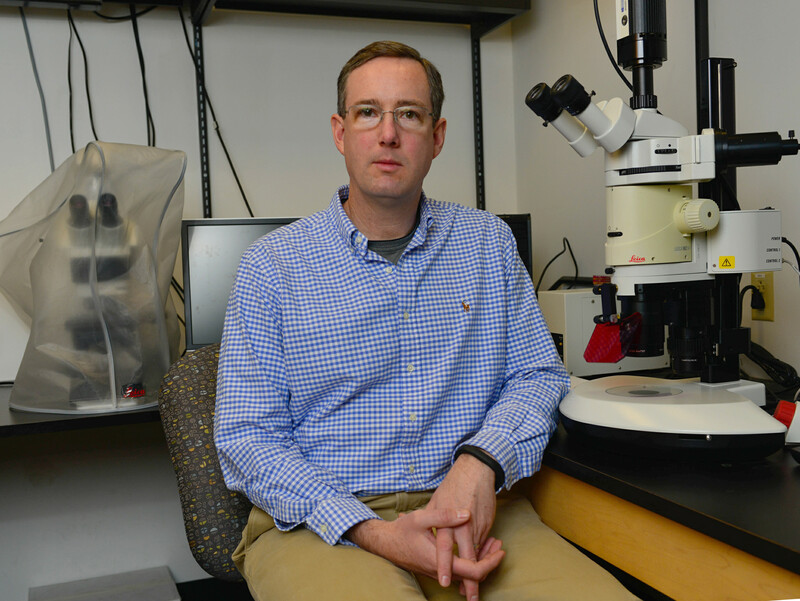 His research focuses on spinal muscular atrophy and more recently, SMARD1. | photo by Hannah Baldwin, Bond LSC . The Lorson lab plans to continue studying SMARD1 and this treatment, in particular, how changing the delivery routes for gene therapy can improve outcomes in treating SMARD1. Injections in the brains of mice are meant to mimic spinal cord injections in humans, but intravenous delivery could be another option. However, intravenous injections, which travel through the blood stream and to the entire body, might cause off-target effects that could interfere with the effectiveness of the treatment. Once researchers better understand how to optimize dosing and delivery on the cellular and organismal level, the therapy can move closer to clinical trials, Lorson said. Even though gene therapy for SMARD1 is still in its early stages, he said he was optimistic that developing treatments for rare genetic diseases is no longer the impossible task it seemed even ten years ago. Spinal muscular atrophy (SMA) is a prime example of a recent success, Lorson pointed out. In the last six years, gene therapy for that disease has moved from the research lab to Phase I clinical trials. The study, “Rescue of a Mouse Model of Spinal Muscular Atrophy With Respiratory Distress Type 1 by AAV9-IGHMBP2 Is Dose Dependent,” was published in Molecular Therapy, a journal published by Nature Publishing Group. This work was supported by a MU Research Board Grant (C.L.L. ); MU College of Veterinary Medicine Faculty Research Grant (M.S. ); the SMA Foundation (C.P.K. ); National Institute of Health/National Institute of Neurological Disorders and Stroke grants; and the Missouri Spinal Cord Injury Research Program (M.L.G.). Although abundant light was shining through the windows, it was the quiet before the storm. Andrew Ludwig, a University of Missouri sophomore majoring in plant sciences, surveyed the small tables and chairs spread out before him in the laboratory of the Benton STEM Elementary School on a recent Monday afternoon. He sifted through his notes. He was ready, even though it was his first time stepping foot in the building — and he was about to talk to a crowd of students spanning from the first to the fifth grade. “I’m just going to try to stay enthused about everything because I’ve talked to some of my friends who are education majors and the big thing with conveying information to them is just being enthusiastic about it,” Ludwig said about his strategy on the “How Do Flowers Drink?” presentation he was about to give with fellow MU student Michael Gardner. 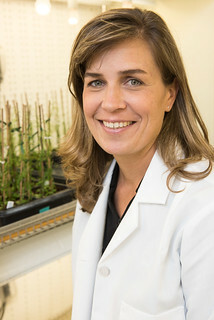 Both Ludwig and Gardner are a part of the team at the Bond Life Sciences Center lab of Melissa Mitchum, an associate professor in the Division of Plant Sciences. It was Mitchum who was able to launch the new “It’s All About Plants” series this spring with the Benton Elementary Science Club thanks to the science outreach portion of a new National Science Foundation grant that will further delve into a deeper understanding of the interactions between plants and parasitic nematodes she received in August and a partnership with the MU College of Education’s ReSTEM Institute, MU Office of Undergraduate Research and Columbia Public Schools. 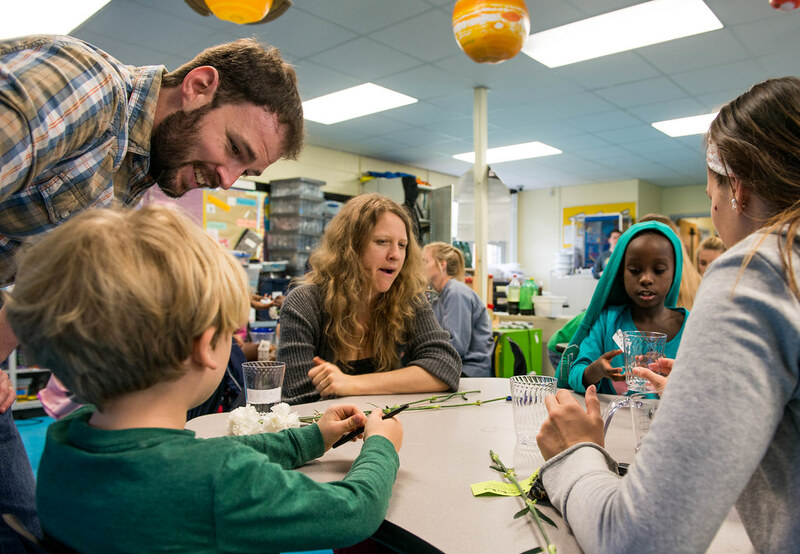 The end result is a program that fosters learning of all varieties: The elementary students learn about plants, while the college students learn how to take complex ideas and break them down to a more accessible level. Furthermore, the program pairs undergraduate students such as Ludwig with graduate students such as Gardner and principal investigator mentors from across campus — involving the existing NSF-funded initiative Freshman Research in Plant Sciences (FRIPS) and the Students for the Advancement of Plant Pathology (SAPP) in the process. With those loud words reverberating through the room Ludwig had the attention of those before him — for a moment, anyway. 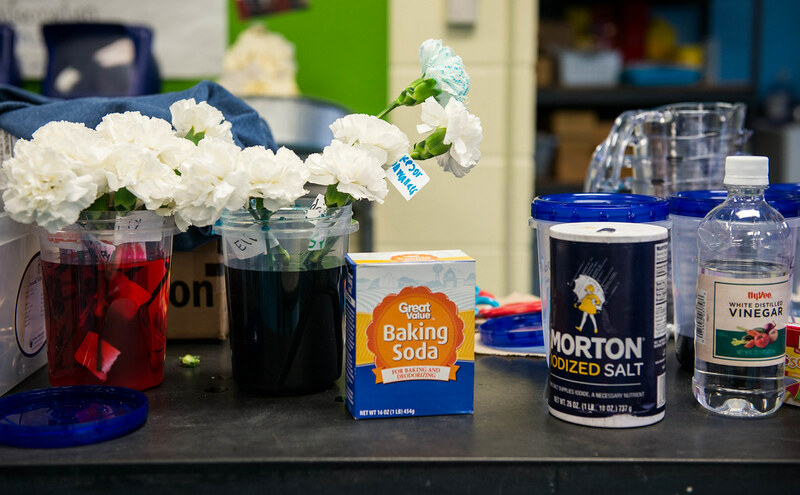 The chatter had quieted down as he began to explain the main activity of the day, which would involve carnation flowers and six solutions of household items (sugar, salt, baking soda, vinegar, soda and food coloring) mixed with water in the same-sized cups – and one scenario with just water. With the help of several volunteer MU students (whose hours are coordinated by Mitchum’s co-PI, Deanna Lankford, a research associate in the College of Education), the assignment was to pour 100 millimeters into each one of the cups. The cups were then labeled with the name of the solution. This procedure was repeated three times. The white carnations were then cut to the height of the cup and placed in the water as a discussion ensued on what solutions would help the plant (besides plain water) and which ones would hurt. Afterwards through the help of a video, the class was introduced to the idea of setting up controls and variables. The one variable, in this case, was the solution. All other factors (such as flower height, flower type, cup size and amount of liquid) were controlled, Ludwig explained. “We use the control to compare our other variables,” he said. A moment later, Ludwig posed a question to the class: “Raise your hand if you think putting the flower in food coloring is going to change the color of the flower.” A collection of hands sprouted upward. “We have some flowers that we put in the dye yesterday,” Ludwig continued, as he unveiled carnations that had white petals either tinged in red or blue to pass around to the class. 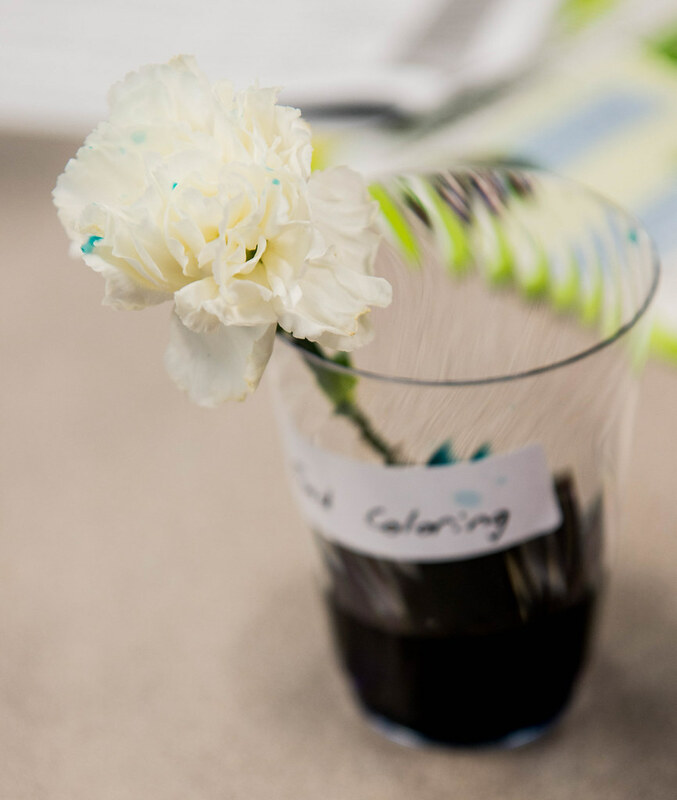 A white carnation begins to show traces of blue food coloring in its petals after sitting in a solution with food coloring and water for a short period of time. 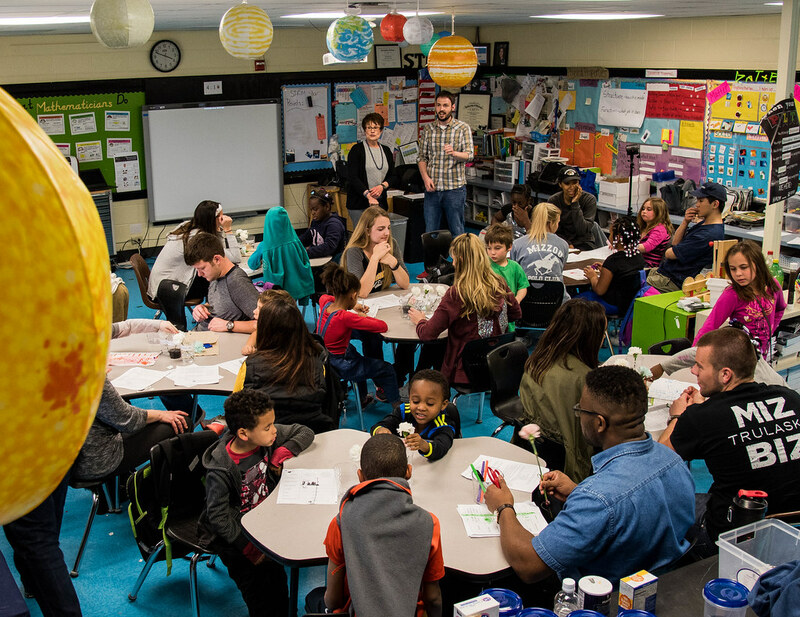 Lankford and the ReSTEM Institute formed the Benton Elementary Science Club, which meets one afternoon every week during the school year, seven years ago — the same time Benton officially became a part of the STEM (Science, Technology, Engineering and Mathematics) program. Over the years, Lankford has helped many principal investigators with the education portion of their grants. 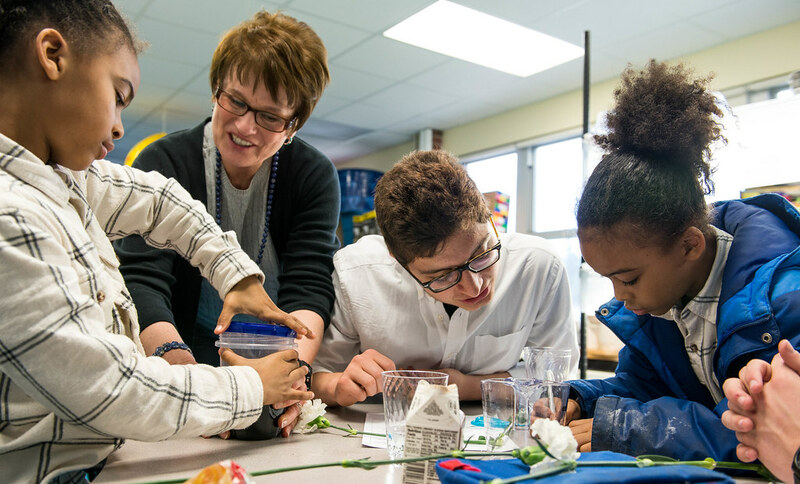 When Mitchum asked her about getting involved with an existing partnership, Lankford immediately thought about the science club with its previously established learning format. Under Mitchum’s direction, a series of meetings were set up with mentors and mentees last fall to develop the curriculum and lesson plans that would form the backbone of the course. Given that the grant is funded for a total of three years, the plan is to continue to teach the “It’s All About Plants” program, which has been well-received by students and school administrators alike, at Benton next spring. Besides Mitchum, the other PI mentors from CAFNR who have taken part in the program are Gary Stacey, Curators Professor of Plant Sciences; Lee Miller, assistant professor of plant sciences; Xi Xiong, assistant professor of plant sciences; Walter Gassmann, professor of plant sciences; John Boyer, Distinguished Research Professor of Plant Sciences; Harley Naumann, assistant professor of plant sciences; Kevin Bradley, associate professor of plant sciences; Heidi Appel, senior research scientist, plant sciences; Jack Schultz, professor of plant sciences and director of the Bond Life Sciences Center; and Scott Peck, associate professor of biochemistry. PI mentors from the College of Arts and Science Division of Biological Sciences included Paula McSteen, Chris Pires, and Mannie Liscum. The CAFNR students who took part in the science club series planning also recently hosted an outreach booth on t the Science Sleuth event on “Plants and Microbes” the MU campus April 16. In addition, Mitchum gave a talk at the Exploring Life Sciences symposium at the Bond Life Science’s Center recent Missouri Life Sciences Week. Furthermore, the end goal is to take all of the lessons that are being created and turn them into a booklet that is easily accessible for teachers in Columbia Public Schools, and beyond, by posting the material online. In the meantime, the lessons are being molded by the interactions of CAFNR students and those at Benton. It’s a challenge that Mitchum said could serve as a benefit to anyone in the scientific community. Would Amahdrion be interested in such a career path?